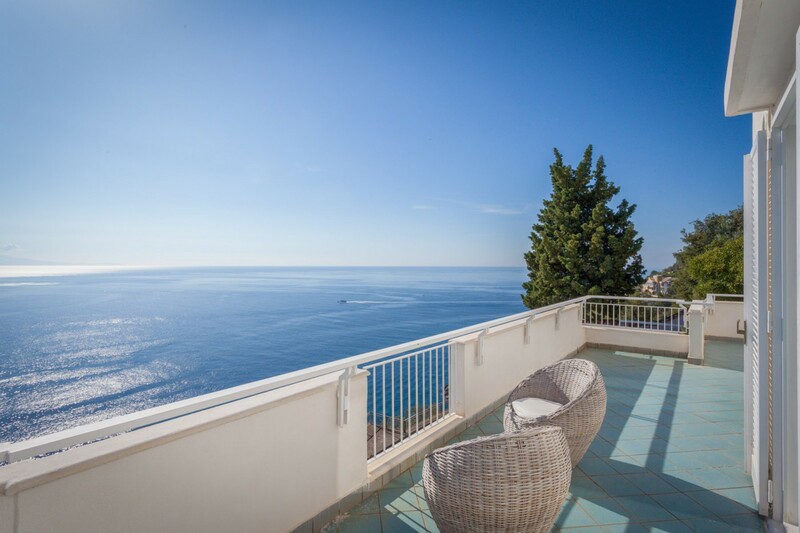 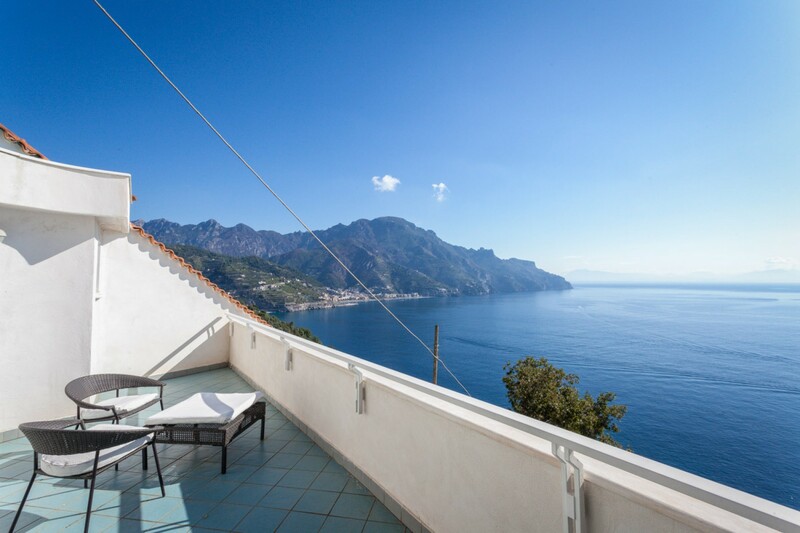 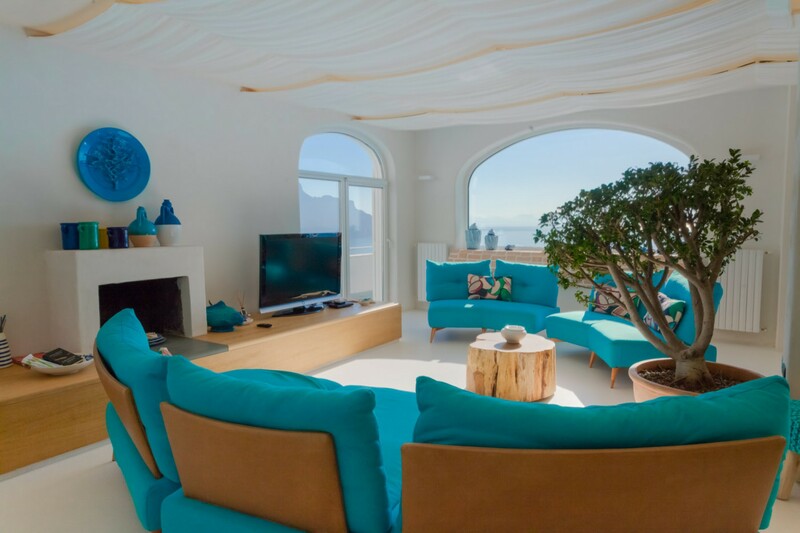 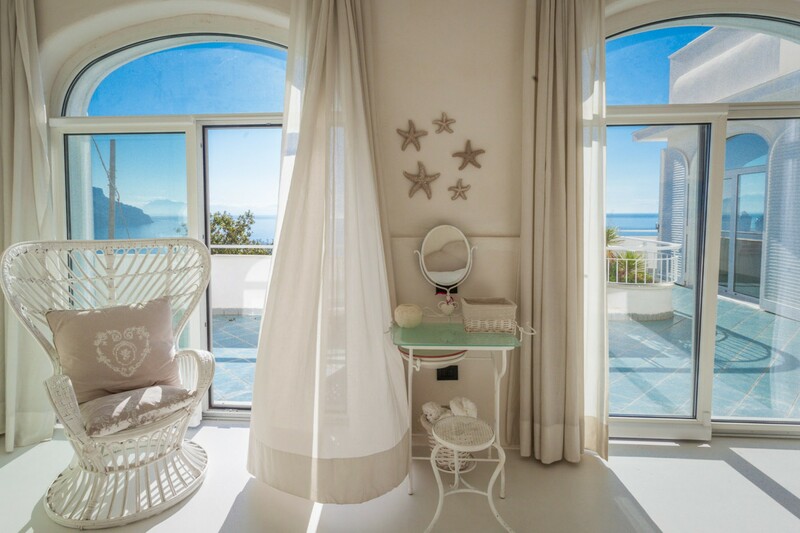 Welcome to Villa Carla, a stunning property perched above the picturesque town of Amalfi. 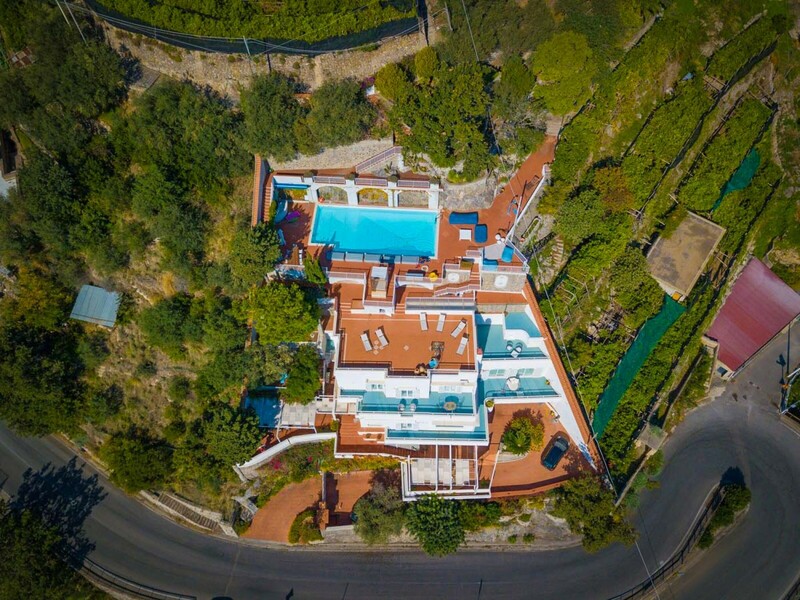 Situated amongst the lemon trees and gardens and with breathtaking views of the Mediterranean Sea it is truly a taste of Italy. 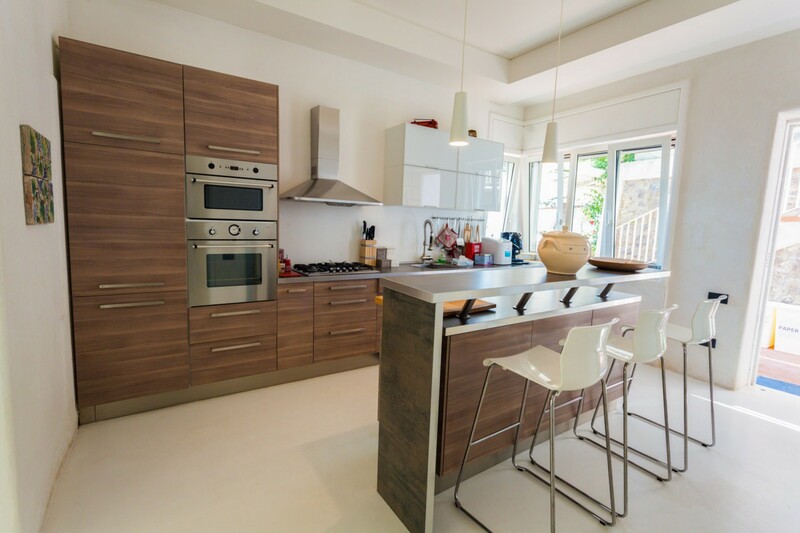 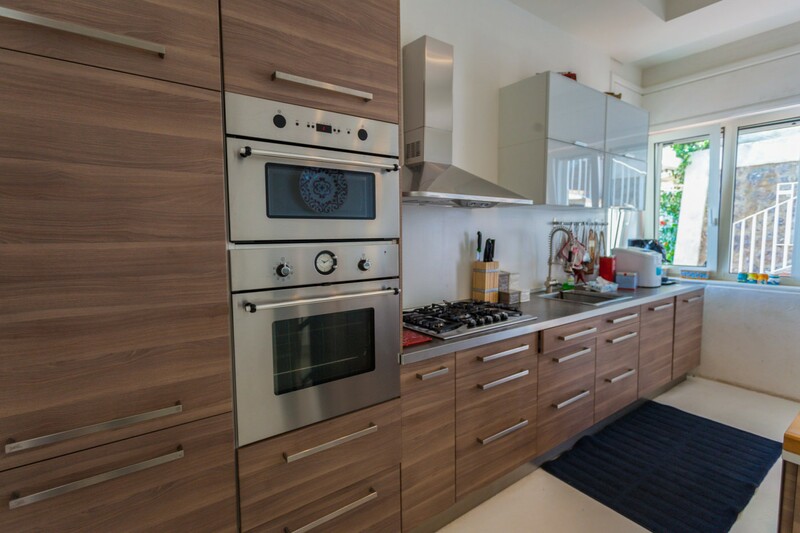 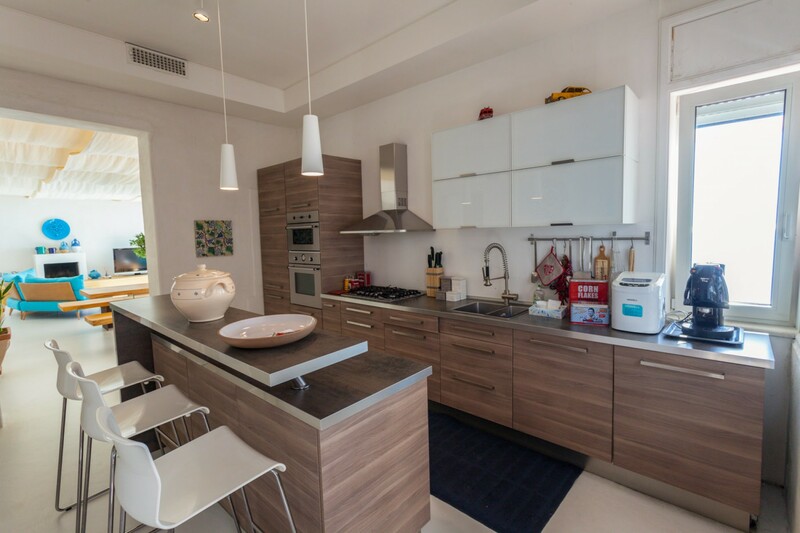 This 4 bedroom property is set on two stories with many different terraces for relaxation. 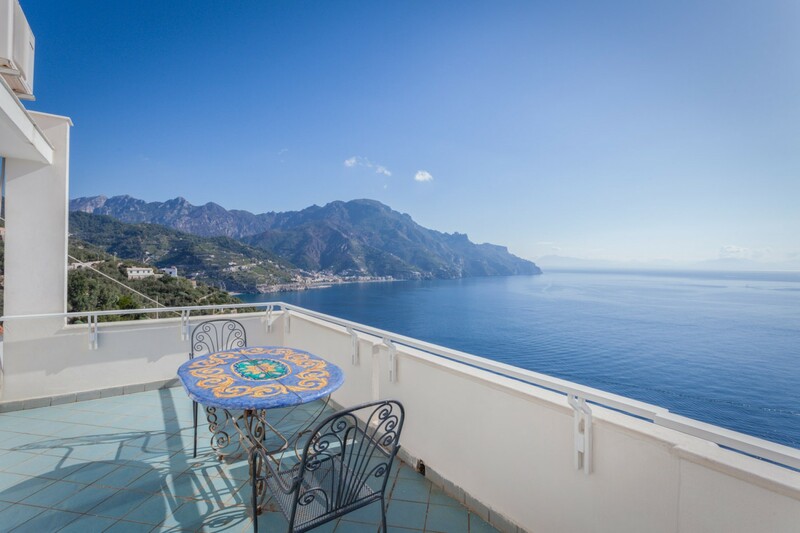 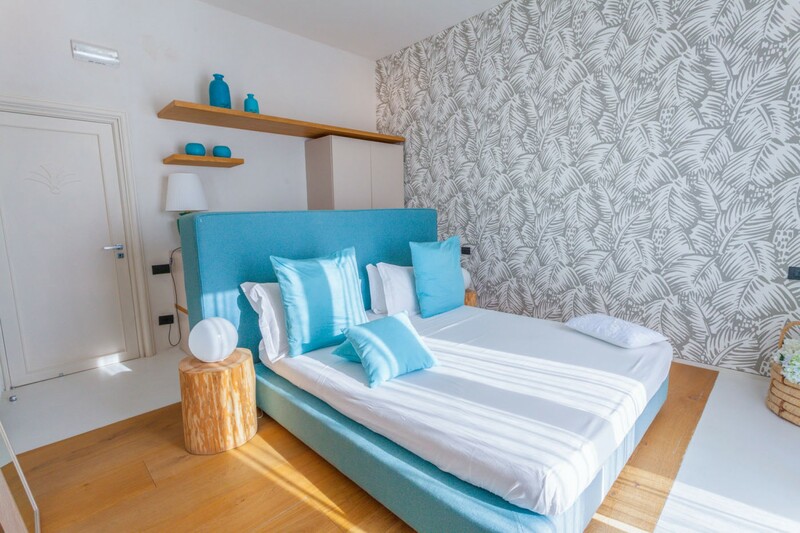 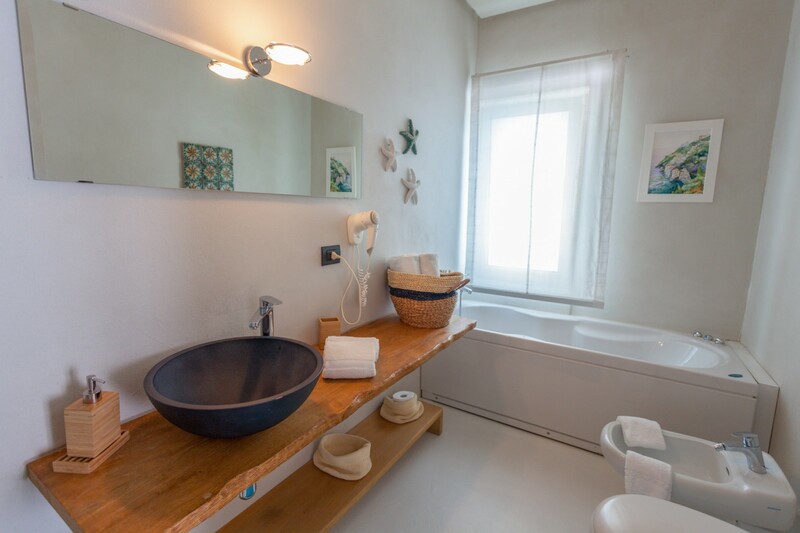 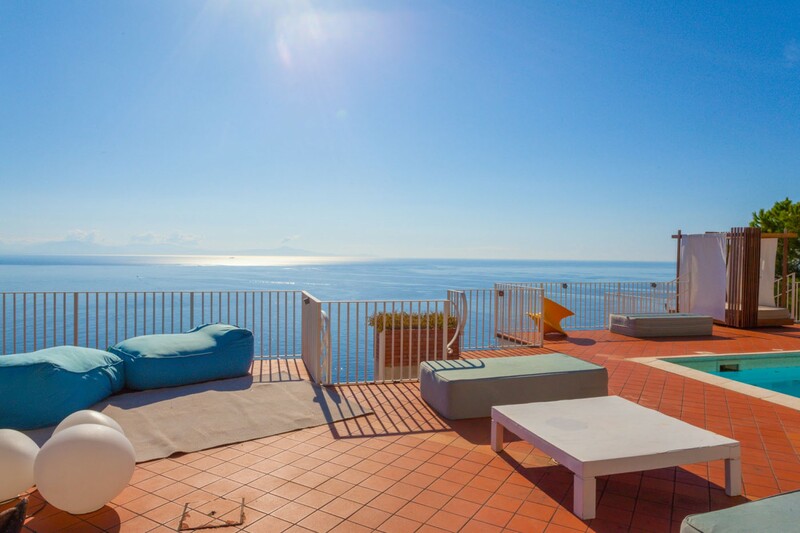 You have fantastic views of the Lattari mountainwhich sweep down towards the Amalfi coastline. 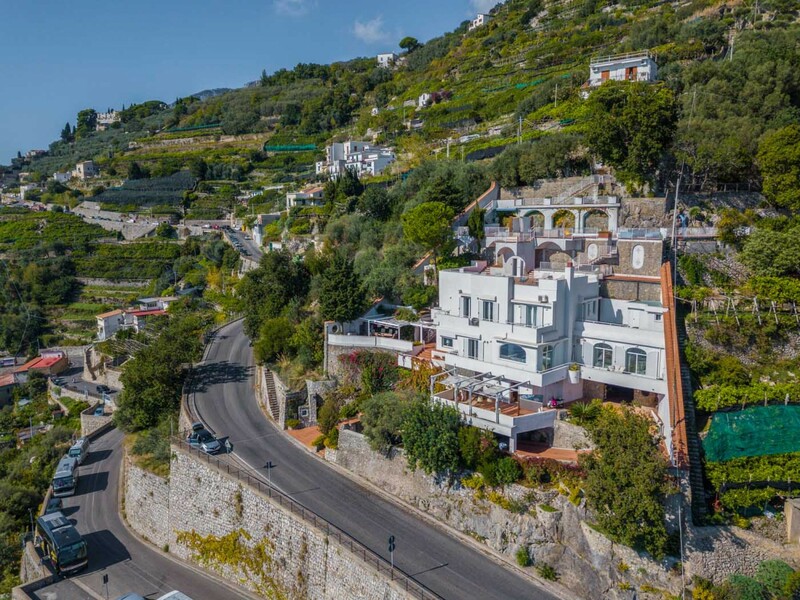 You are surrounded by many quaint little villages like Ravello and Scala which are above you and Amalfi and Minori below you. 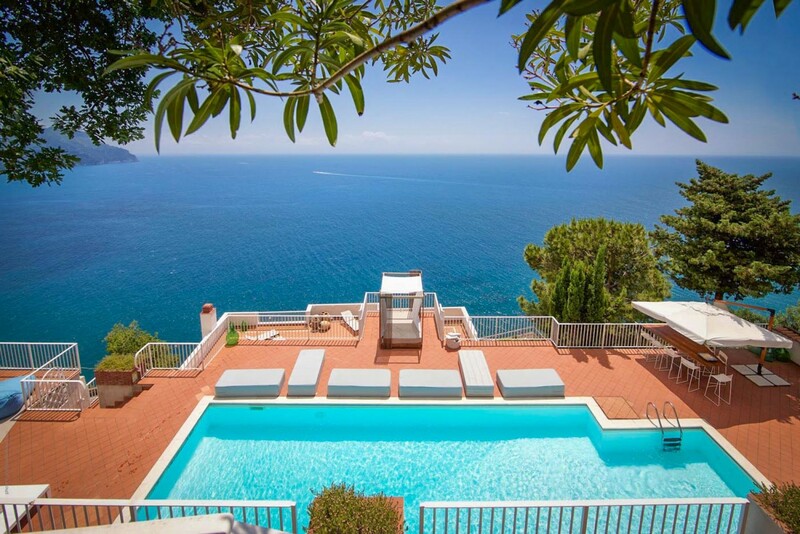 The beaches are also just a few minutes’ drive from your villa. 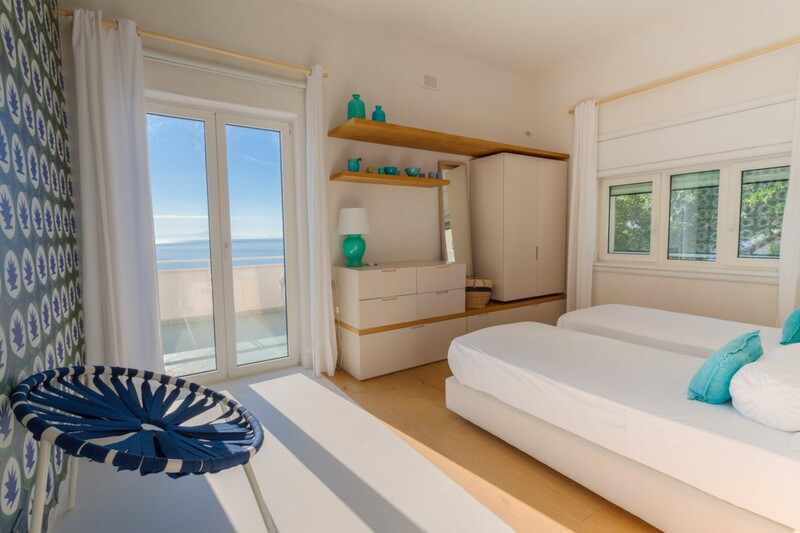 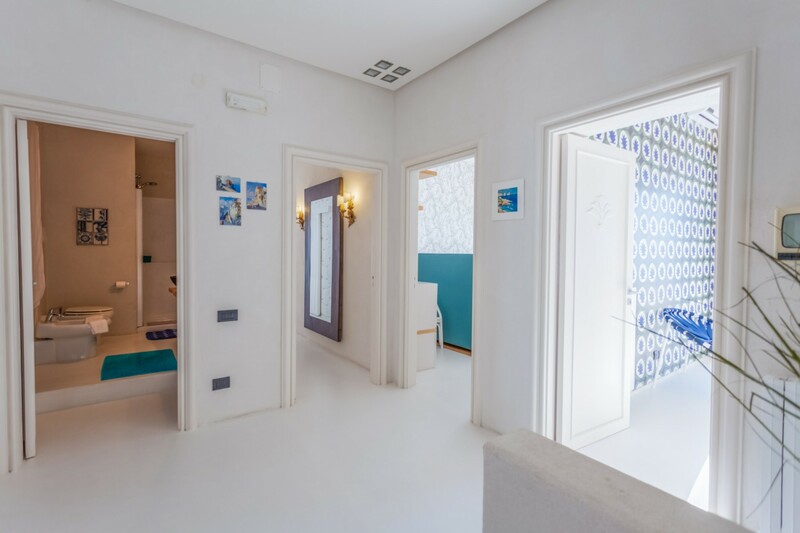 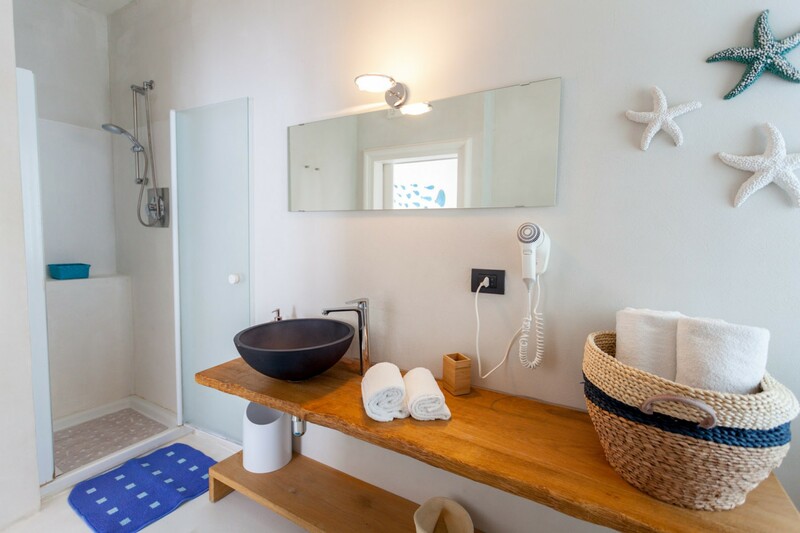 Villa Carla is not your typical Italian property; it has a very modern feel about it which you will notice when you walk in the doors. 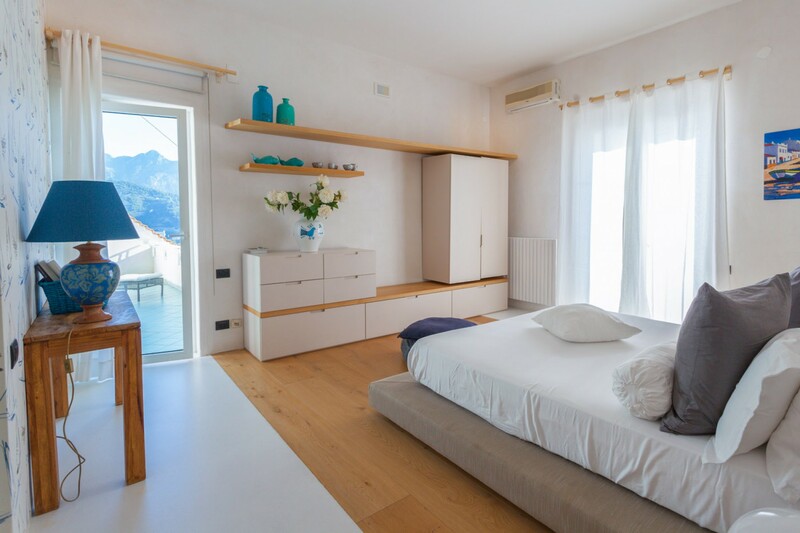 The rooms are bright and fresh with clean lines and neutral colours. 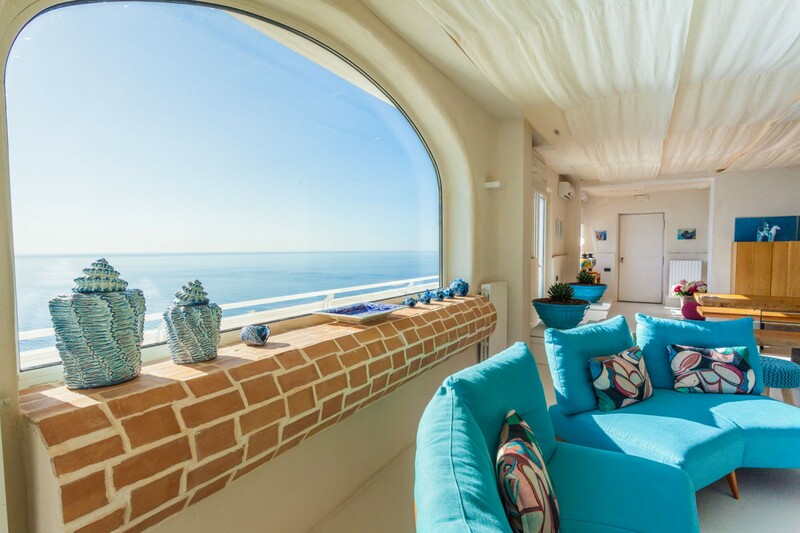 The living area is large and spacious with views of the ocean from most corners. 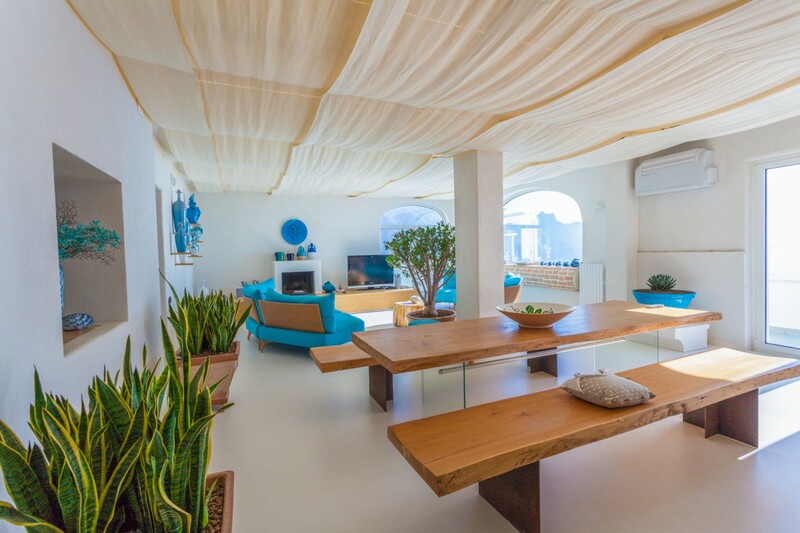 Furniture is trendy to say the least; it has a very comfortable blue couch and glass coffee table for your enjoyment and also a long wooded top dining table with transparent seating chairs. 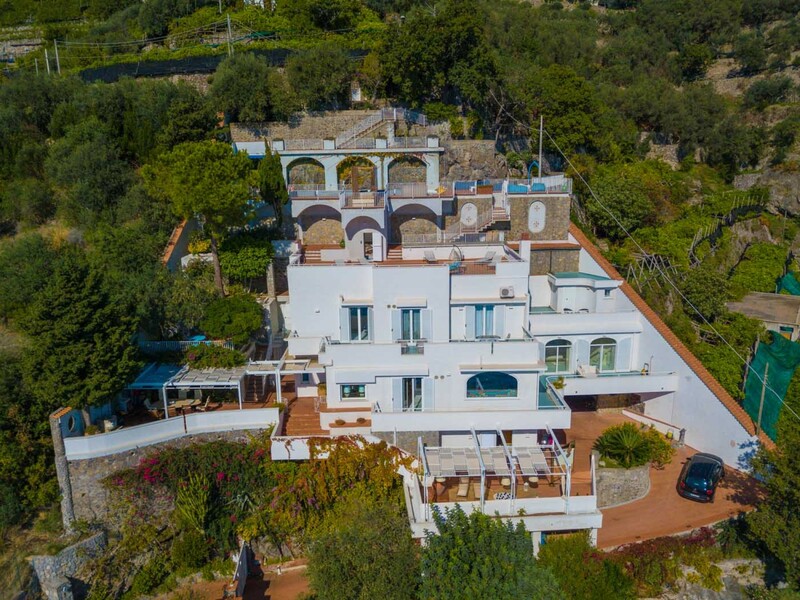 The house comprises of 2 levels with a queen and single bedroom on the ground floor these have access to a terrace and more importantly ocean views. 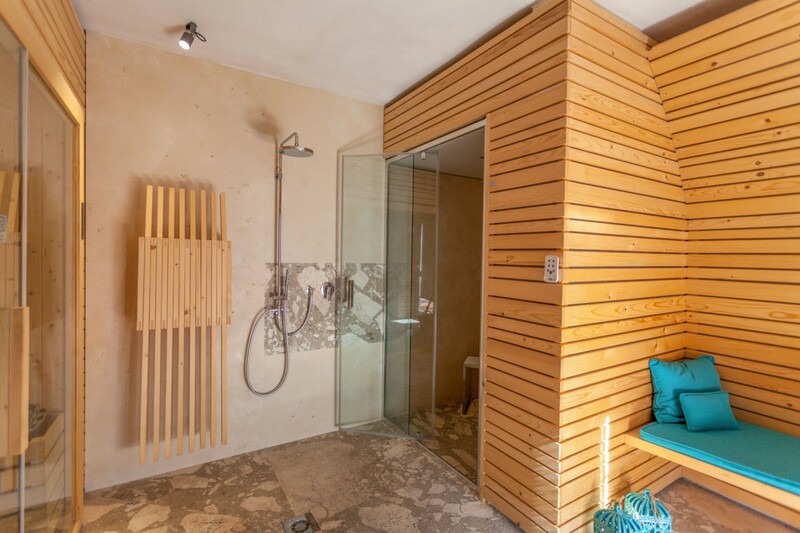 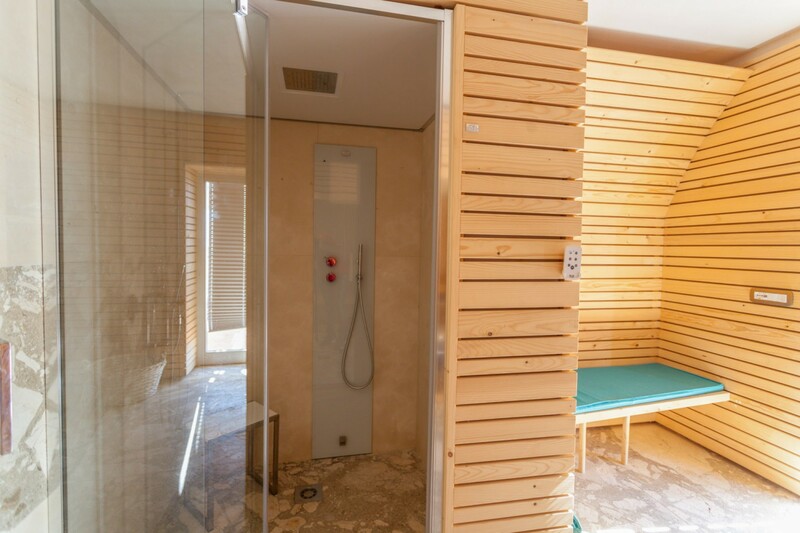 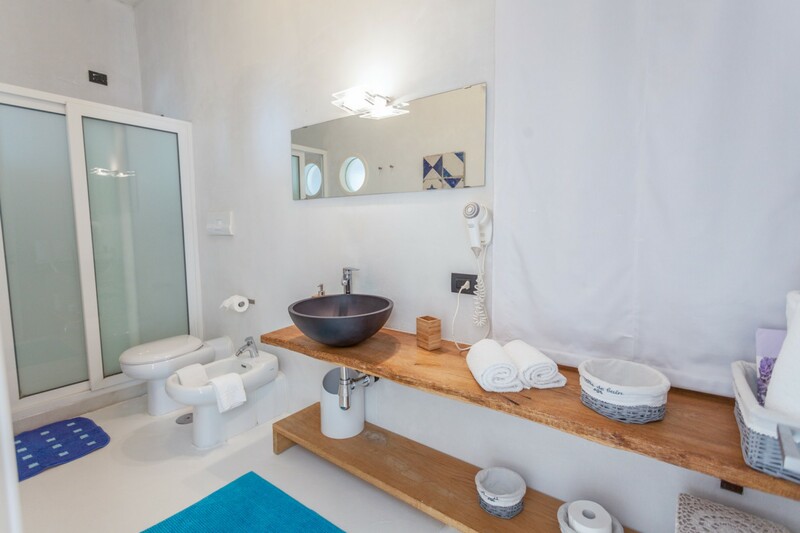 Both also have bathrooms with private showers. 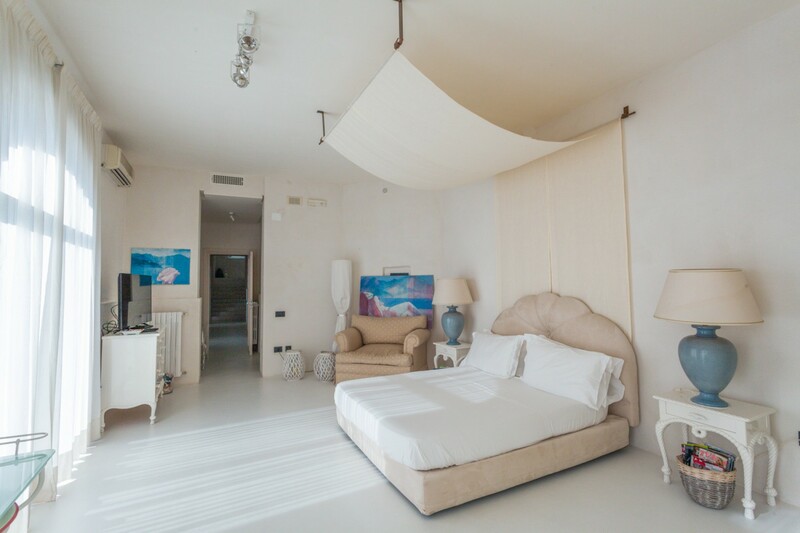 The upper floor has a queen bedroom en suite and a larger room with a queen and twin beds. 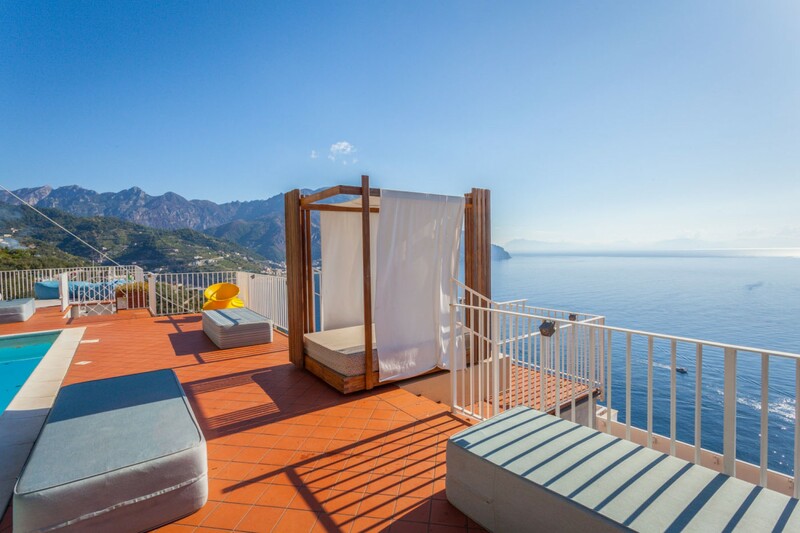 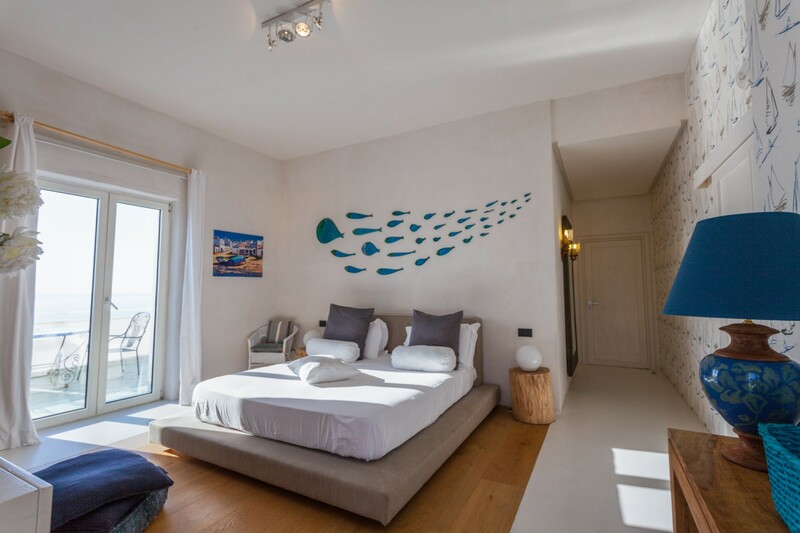 An important point to note is that all bedroom have their own terraces and spectacular ocean views. 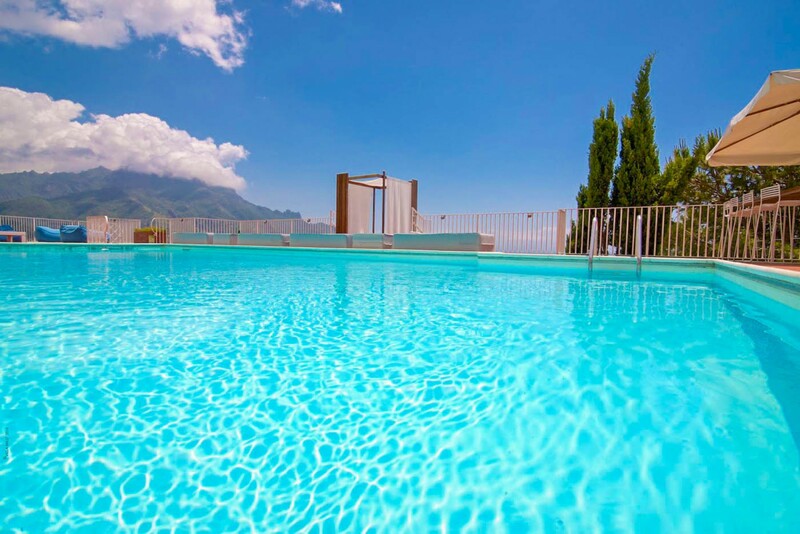 This property has all the facilities you would want for a perfect holiday. 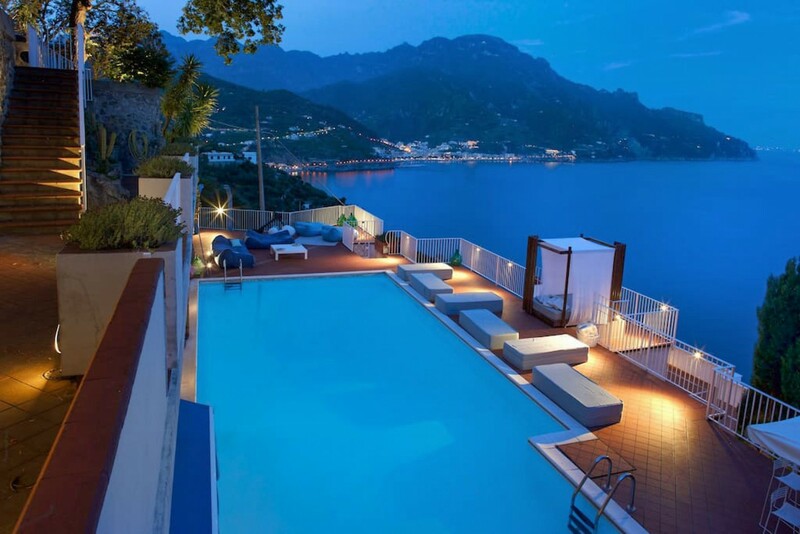 It boasts a 16 meter swimming pool surrounded by sun loungers, umbrellas and outdoor showers. 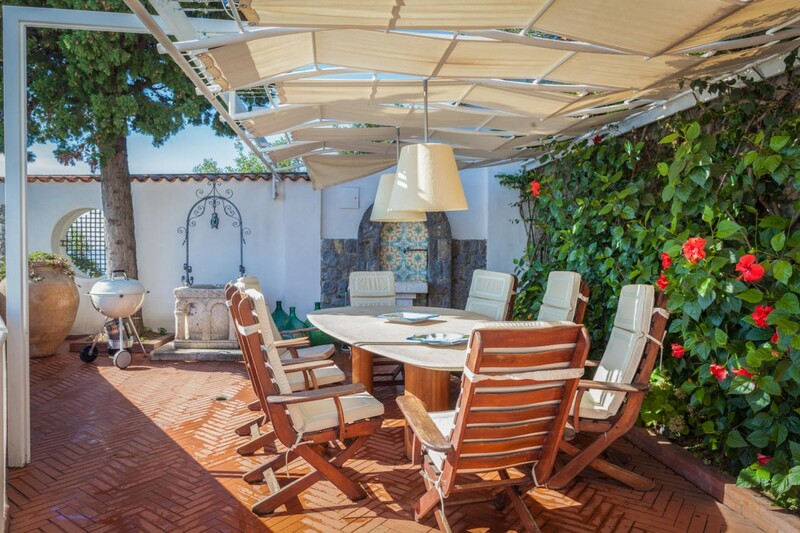 It has both open and shaded areas for AL fresco dining, charcoal barbecue and a Mediterranean sunset that will leave you speechless. 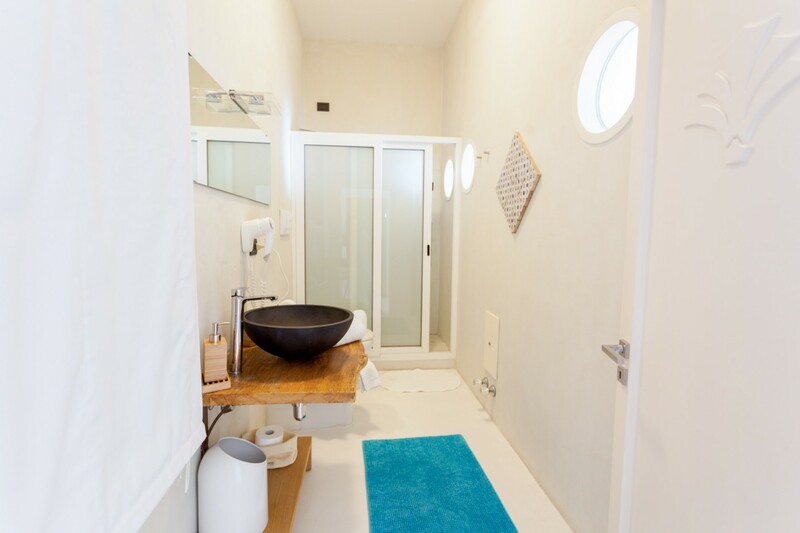 There are a few steps to the property and a few to the upper floor as well; it also has parking for 3 cars. 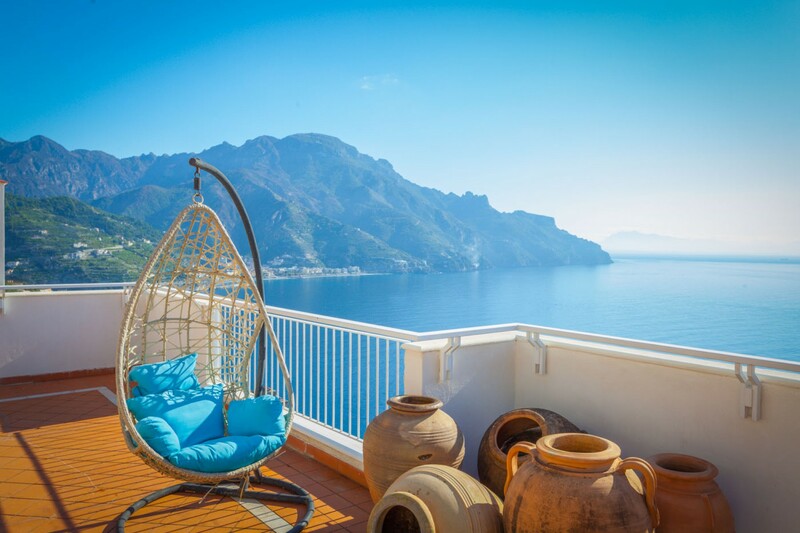 Buses run frequently to the towns and villages where you will fine beaches, shopping, post offices, banks and quaint little café and restaurants serving fine ravello food. 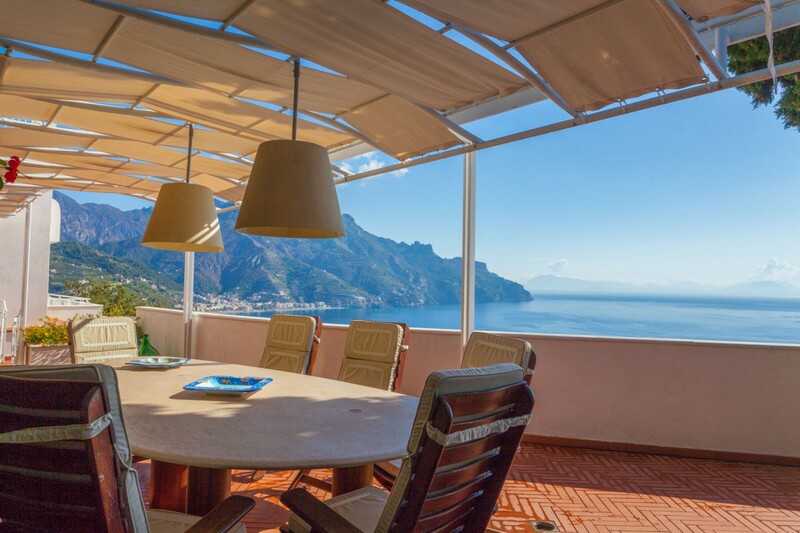 One can also pick get the daily ferries from Maiori and Amalfi for excursions to Capri (1 hour), Positano (30 min. 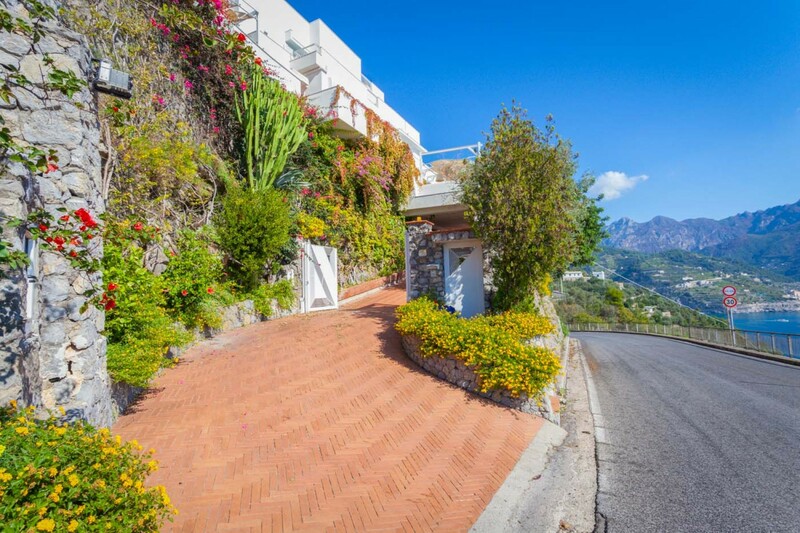 ), Ischia (2 hours) and Salerno (1 hour).